For this project I started off by doing research on Frida to expand my knowledge on her. I then decided what drawing I was going to mimic of hers and who I was going to put on it. I started off by writing the the first paragraph and then checking it with Susy after that I made my picture. Then based of the picture I did, I wrote the next two paragraphs and then checked it with Susy again. When I had my finished picture and refined paragraphs I printed them off and glued them to a piece of paper and hung it up in the hall! Why do you think Frida Kahlo painted so many auto-biographical paintings of herself? I think she painted so many photos of herself to release her emotions. How do you feel that your image came out? I feel it came out well, I spent a lot of time on it so I was happy with the results. Did you end up with the image you thought you were going to when you made your project outline? At first I wasn't sure what or who I was going to do but as soon as I decided I feel it came out just how I wanted it to. How would you do this differently if you were to start over again? If I were do do this project over I would spend more time on my paragraphs. In this project we learned about day of the dead. We drew ourselves as skeletons. This was a fun project and I learned a lot! Me llamo Julianne Marqua. Soy de Durango, Co. Yo soy la hija de Mary y Jay, la hermana de Zach y Catie, la nieta de Popy, Babs, Nana, y Charlie. la sobrina de Anne y Alan, la maestra de mi perra Roxie. Yo soy la prima de Bridget, Abby, y Maggie. Me gusta musica. Yo escucho Ed Sheeran y Foy Vance. Yo miro “Spongebob” a la televisión. Yo miro “Finding Nemo” al cinema. Yo leo The Fault in our Stars a la casa. Yo soy peliroja, simpatica, guapa, y normal. Yo tengo una guitara, una famila, y una perra. Yo quiero la casa lejo de Durango, muchos ninos, y buen empleo. Tengo huesos blancos. Mis dedos esqueléticos juegan la guitarra cuando yo canto. Es muy divertido. Me gusta escuchar la música. Yo no soy buena en la guitarra. Sonrío cuando toco música. La música es hermosa. Musica es mi passion. Learning about Day of the dead was fun. I learned that it is a celebration of life instead of mourning over death. It is a happy holiday with a ton of skeletons. 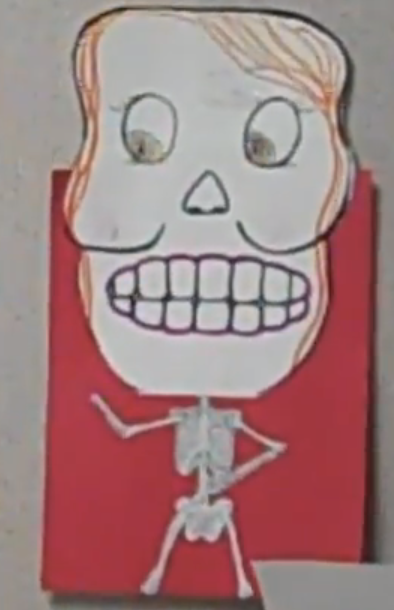 My skeleton represented me because it was formed to look like it was posing or dancing, something I do a lot in theatre. I am proud of the paper I wrote because I put my best work in to it. To me the most difficult part of this project was being creative with the skeleton because I crammed finishing it in to a short amount of time. Next time I would spend more lunch hours working on my skeleton because I knew i was going to be absent.